The Xperia E5 boasts up to two days of battery life per charge and runs Android Marshmallow. Sony is looking to appeal to those on a tight budget with the new Xperia E5, an affordable yet capable and fun smartphone. 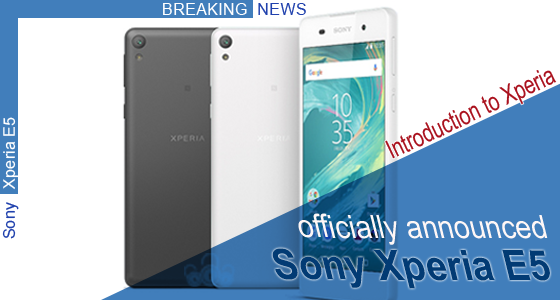 The Android 6.0.1 Marshmallow-based Sony Xperia E5 bears a design similar to the recently unveiled X-series of smartphones, and sports a 5-inch HD (720x1280 pixels) display. The Sony Xperia E5 Dual features identical specifications to its single-SIM variant, and is powered by a 1.3GHz quad-core MediaTek MT6735 SoC, coupled with 1.5GB of RAM. The Xperia E5 features a 13-megapixel rear camera with LED flash, and a 5-megapixel front camera that's also accompanied by an LED flash module. It bears 16GB on inbuilt storage that's expandable via microSD card (up to 200GB). It supports Nano-SIM cards. Connectivity options on board the Xperia E5 include 4G LTE, Wi-Fi 802.11 a/b/g/n, NFC, FM radio, Micro-USB, and Bluetooth. It is powered by a 2700mAh battery rated to deliver up to 2 days of battery life with mixed usage. It weighs in at 147 grams, and measures 144x69x8.2mm. Performance you can rely on, with three elements providing the power to do more - fast processor, large memory capacity and up to two day's ONE battery life. Xperia E5's battery is long-lasting so you can use it for up to two days between charges - downloading apps, streaming video and browsing social networks, all without regularly reaching for the plug socket. Sony Xperia E5 launches across select European, Latin American and Middle East & African markets from late June 2016. With the largest database on the web for phones and service providers, UnlimitedUNLOCK will not be beaten on price. We can unlock and free up your Sony Xperia E5 using the official Sony Ericsson & Sony Xperia.